Do you have any idea what my husband is demonstrating for me? Can you get any goofier? I believe Jonathan is using the improper technique. Be sure to prop pillows so that your head rests on something so you are not using your stomach muscles:-) Relax! and have a wonderful day Ashley. Now you need a screen projector, so you can easily read the screen from bed. Jonathan could bring in a screen like people used for slide shows, or hang a big sheet on a wall or something. And hook a projector up to the laptop to make it all work. If anybody can do it, it's Jonathan. That's a great idea, Peter. I'm also thinking about moving the couch from home into the room. Good point, Carol. We could also use velcro and attach the keyboard to her burgeoning belly for added stability. The beauty of it is that everything you've listed can be done with duct tape, bailing wire, and a few leftover building materials I have sitting in the garage. The surround sound system might require some digging through the electronics odds and ends in the basement. I love my wireless keyboard. I had mrangelmeg get me one for Christmas a few years ago so that I could work on my computer from the comfort of my bed. 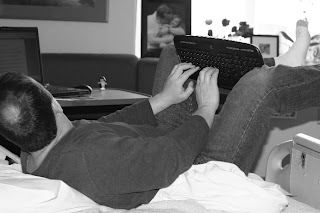 I don't usually lounge in bed to use the computer but the luxury of not being tied to the desk (or in the case of the new computer having to always use a laptop keyboard ) is an awesome luxury. I agree that whatever Jonathan can do to make you comfortable he should be doing, I mean it isn't as if he has all that much else to do. "YOU #$@%#%&, WHAT HAVE YOU DONE TO ME!" "PUSH!PUSH,there we go. It's a...it's a...POEM!"